Despite respectable efforts, the volleyball team lost its final game of the season at Saint Leo University. In a match filled with spectacular rallies and an inspiring display of sacrifice, the Tars ultimately fell 15-25, 11-25, and 22-25. Libero Jessika Linnemeyer (‘22), who registered a team high of 14 digs, stressed the extra motivation associated with the last game of the season. “It was a tough loss for sure. We left it all out there and we really played for the seniors, even though we didn’t pull off the win,” Linnemeyer said. The Tars were not inferior to the opposition by any means, but their attempts to gain momentum during the match was spoiled by simple mistakes. For seniors Kerra Tirado, Sam Schlesman, and Rachel Fletcher, this game was their last time donning Rollins jerseys and the trio bowed out in style. With four block assists, Schlesman stood out in a particularly good defensive performance for Rollins with a total of seven team blocks. Fletcher held seven kills of the night, more than anyone among the Tars’ ranks. 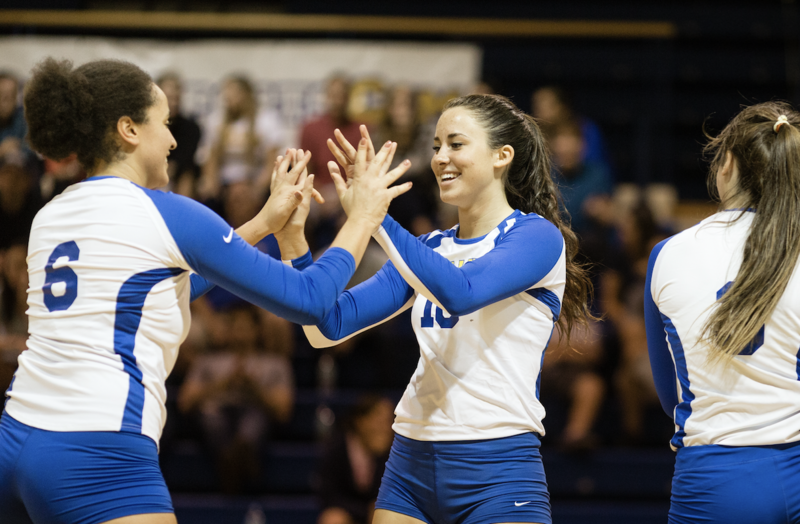 Tirado, on the other hand, was a role model for efficiency with her .750 hitting percentage. Robinson described the seniors as leaders by example, lauding their dedication and work ethic. Linnemeyer spoke of them with gratitude: “It can be tough when it’s your last year to be welcoming and to remember the dynamic of the team. But the entire season, they were so supporting. They’re people that all the freshmen look up to and hope we can be leaders as when we’re seniors,” Linnemeyer said. Fletcher described her last game as being surreal. The senior, who reached the 1,000 career digs mark in September, had only good things to say in retrospect. “It was always a pleasure getting to play with Bri Civiero (‘18) and Shannon McDonough (‘18), learning from the people who were above me, and now as a senior, it is really nice getting to mentor the younger ones,” Fletcher said. With an overall record of 4-26, it is hard to escape the cold reality of the numbers. But, as the loyal members of the student section will tell you, to judge the Tars’ season based only on the statistics would be a disservice to their potential. Slowly, but surely, the newcomers are starting to make their mark. Linnemeyer has consolidated herself as a reliable libero. Candace Doxley (‘22) pulled off three block assists and four kills against Leo. Adriane Griffith (‘22) had a solid performance, too, and Rebecca Kuehn (‘22) registered the Tars’ only ace of the game and has consistently been among the top assisters in the team. With spring preparations around the corner, now the real fun for Robinson begins. “The nice part about the spring is we get to work methodically, less focused on results and making sure that we’re building those skills that we need going into next season,” she said. At times like these, the line between athletics and wisdom blurs. The seniors know this better than anyone.